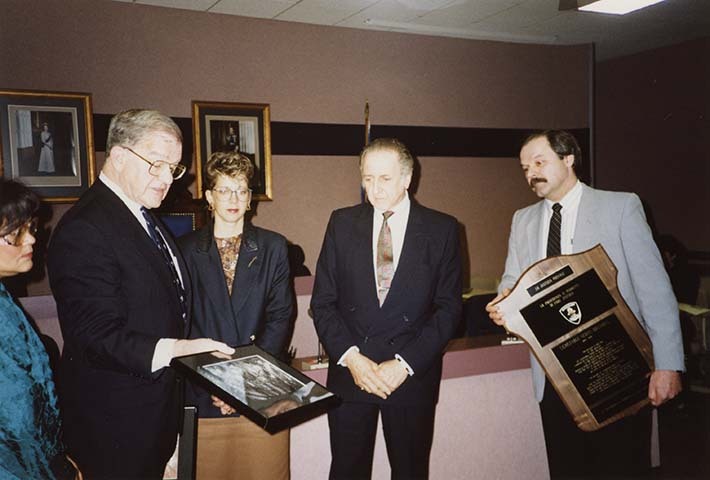 Photograph of Windsor Police Commission apology and presentation to Brombal family, Windsor, ON, December 11, 1990. The presentation was made by the Chair, John Whiteside, who is shown handling an archival photograph. Also present was Italian vice consul, Ron Moro, who holds the commemorative plaque. Nereo Brombal immigrated to Canada from Italy ca. 1914. He had met his German-born wife in northern Ontario. The family would settle in Windsor and the Brombals had 2 children.